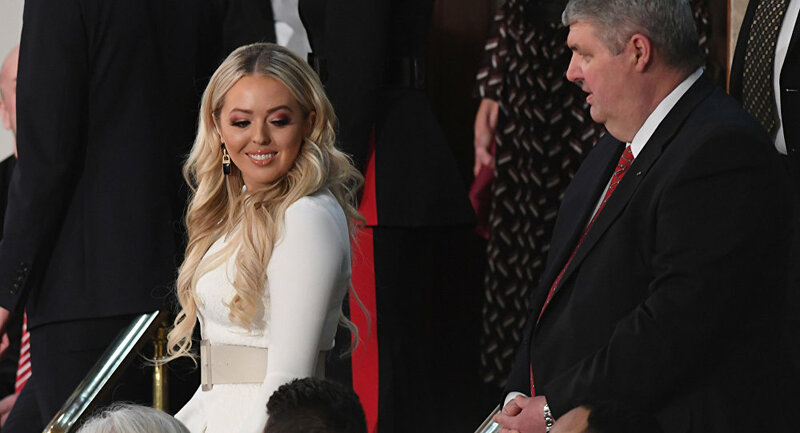 Social media users speculated whether Tiffany's ensemble had a political significance, and was an intentional statement, or was chosen by a twist of fate. — Amy (@bunnyhugger75) 6 февраля 2019 г. — Monica Hesse (@MonicaHesse) 6 февраля 2019 г. — David Knowles (@writerknowles) 6 февраля 2019 г. — Sally Kohn (@sallykohn) 6 февраля 2019 г. — Vanessa Friedman (@VVFriedman) 6 февраля 2019 г. — trophy husband (@SohailBuddy) 6 февраля 2019 г. — Kenipedia (@ghettobiologist) 6 февраля 2019 г. — Melly (@mphillig) 6 февраля 2019 г. — SophieBushman (@sophiebushman) 6 февраля 2019 г. — tiff ♡ (@smileysope) 6 февраля 2019 г. The chair of the House Democratic Women’s Working Group encouraged members to wear "suffragette white" to President Trump's second State of the Union address to honour the legacy of women's suffrage and "send a message of solidarity that we’re not going back on our hard-earned rights". — Rep. Lois Frankel (@RepLoisFrankel) 30 января 2019 г. — Nanette D. Barragán (@RepBarragan) 5 февраля 2019 г. — Jan Schakowsky (@janschakowsky) 5 февраля 2019 г.